Newcastle United will hope to continue their positive form when they face Southampton on Saturday at St. James' Park. The Magpies have had a week to bask in the glow of their historic victory at Old Trafford. Now, the club will have to deal with more lofty expectations and everything that comes with it. They are within sight of European qualification, although it is still very early in the season. Pardew will be looking for a good effort against a well-organized and disciplined Southampton side. The Magpies will surely need to beat quality mid-level opponents like Southampton to get to Europe. Newcastle will be without Old Trafford hero Yohan Cabaye who will be serving a one-game suspension on Saturday. However, it does appear that they have some significant advantages going into the match. Newcastle are relatively healthy and will be playing at home in front of their fans. Southampton on the other hand have been dealing with injuries to several key players. Also, after an excellent start to the season, Mauricio Pochettino’s club have not won in their last four Premier League matches. The two clubs are currently next to one another in the Premier League table. Newcastle remain three points ahead of Southampton for seventh. But the teams appear to be heading in opposite directions. The Magpies rebounded from a poor showing against Swansea City, with a brilliant overall performance in a win at Old Trafford. They have won five of their last six league games overall. That includes victories over Chelsea, Tottenham and Manchester United. The Saints have been struggling. After an excellent start to the season, Southampton have only won twice in their last eight league matches. However, that does include losses to Arsenal, Chelsea, as well as draws with United and Manchester City. Newcastle could expect a difficult match against Southampton. Pochettino’s squad have only conceded 14 goals in 15 matches in the league this season. They are tied with Everton for the second best defensive record in the Barclay’s Premier League, behind only Arsenal. The home team won both contests between these two clubs last year. Southampton won 2-0 at St. Marys’ in November 2012, while Newcastle won 4-2 at home in February. Yohan Cabaye picked up his fifth yellow card of the season against Manchester United and will miss the match. Papiss Cisse is still battling a heel injury and remains doubtful for the clash. Other than that, Alan Pardew’s squad does not have any significant injuries. Southampton will be missing several key players on Saturday. Among them, highly rated Kenyan midfielder Victor Wanyama who is out for several weeks after chipping a bone in his lower leg. Polish goalkeeper Artur Boruc broke a bone in his hand in a recent match against Chelsea and is therefore out long term. Midfielder Morgan Schneiderlin and right-back Nathaniel Clyne are also battling injuries. They both missed the match against Manchester City last week and remain doubtful for Saturday. Alan Pardew relegated Shola Ameobi to the bench against Manchester United, deciding instead to play Loïc Rémy alone up-front in a 4-2-3-1 formation. This time around, Pardew will have to make up for the notable absence of Yohan Cabaye. Cabaye played behind Rémy on Saturday in the number 10 position, which is a place that Hatem Ben Arfa would feel comfortable in. 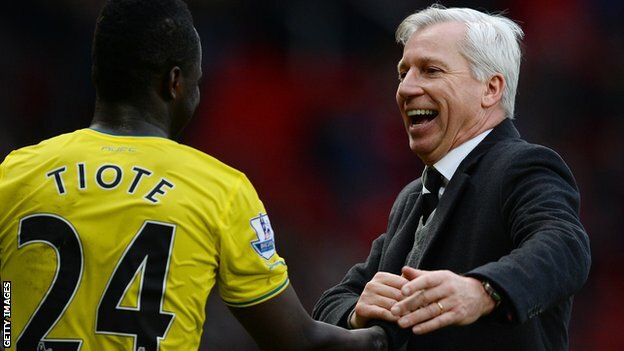 But Pardew could also refer back to a 4-4-2 formation. Vurnon Anita played well against Manchester United, and may have earned himself more playing time. Loïc Rémy has not scored in his last three Premier League matches, which is a significant drought for a quality striker. Goalscorers tend to score goals in bunches, and Rémy could prove decisive in this match. Mauricio Pochettino has favoured a 4-2-3-1 formation for much of his time at Southampton. Injuries to key players, will force him to alter his squad selections. Argentinian Paulo Gazzaniga will be in goal for the club. He is 21-years-old and has played in only 12 Premier League matches. Without the services of Wanyama in central midfield, the Saints will need other players to step up. English midfielder Adam Lallana has been in good form this season and is surely a player to watch. Winger Jay Rodriguez leads the team with five goals. Italian striker Pablo Osvaldo has had a difficult time adjusting to English football so far but remains a serious threat. As does Rickie Lambert, who despite splitting time with Osvaldo this season, remains second on the team with four goals. But Southampton’s defining strength is its ability to keep goals out of their net. Centre backs José Fonte and Dejan Lovren have been in excellent form this season. So have young English full-backs Nathaniel Clyne and Luke Shaw. Although Clyne has a hamstring injury and is unlikely to play against Newcastle. Alan Pardew will be concerned about his team’s mentality after their emotional victory over Manchester United. Southampton are a frustrating side to play against, and Newcastle will have to be at their most clinical. Despite not winning in four matches, Mauricio Pochettino’s squad have still played well in those games, giving their opponents all they could handle. However, injuries to key players will surely impact their ability to score goals. Newcastle United, bursting with confidence, should prove to be too much on this day.